Preservation of Cpt Inglefield, the Master, and Ten of the Crew of the Centaur in the Pinnace, Robert Pollard, 1784, National Maritime Museum. The 74 gun Centaur was a French ship of line launched in 1757. Along with two other ships of the line, she was captured by the British two years later at the Battle of Lagos, one of the key events in the Annus Mirabilis of 1759 that is still celebrated in the first verse of "Heart of Oak." That same year, John Nicholson Inglefield joined the Royal Navy and steadily rose through the ranks. Inglefield and the Centaur came together in 1781 when Inglefield was given command of the ship by Admiral Hood. 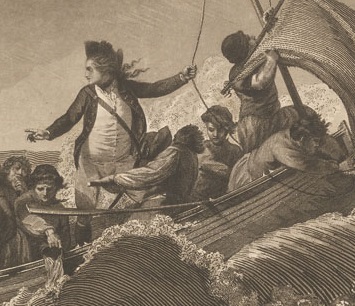 Inglefield guided the ship and her crew against the French in the waning days of the American Revolutionary War, and fought at the Battle of the Saintes. 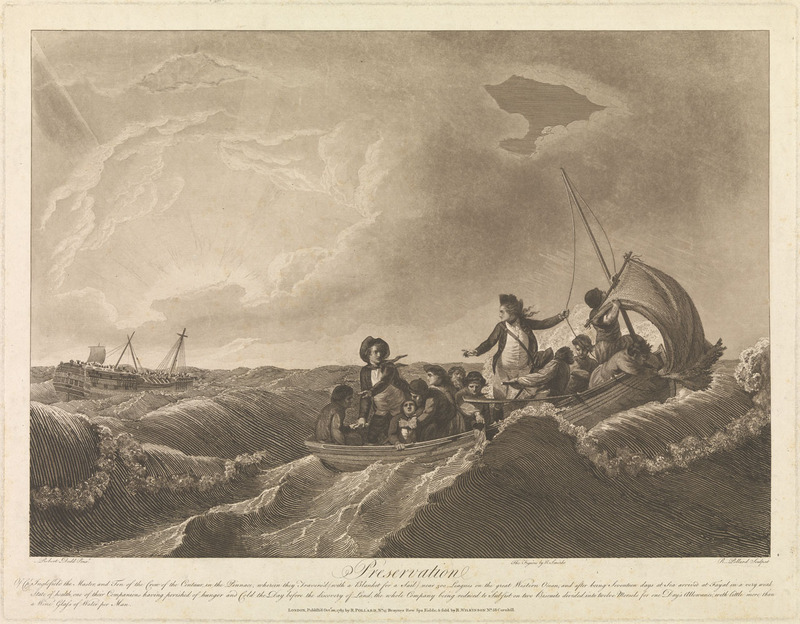 On returning to England in convoy in 1782, the Centaur was caught in a hurricane. Reduced to little more than a rudderless, mastless, and aging hulk, she began to founder. Hundreds of crewmen went down with her, but the captain and a handful of men managed to board the ship's pinnace. Without any navigational equipment, they managed to steer her to the Azores and safety. All told, the survivors spent sixteen days on the pinnace with almost no food or water. At the tiller is a dejected looking fellow, helped by a man in frock, waistcoat, and breeches. This might be a midshipman who threw himself from the deck of the ship and into the pinnace just as she was pulling away. The sailors are largely unremarkable. The coxswain wears a close fitting knit cap, and a dark jacket. The others wear the same style of jacket. Grasping his mate (who in turn clings to the larboard rail), another jack wears a knit cap and petticoat trousers/slops. To the port is a man with a wider brimmed round hat, and another with bob style hair. 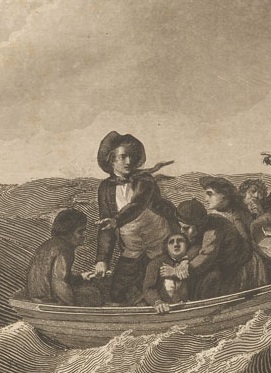 Standing amidships and holding a line to the pinnace's tattered sail, Captain Inglefield gestures to his men while stealing a glance back to his sinking ship. Most of the men around him are hatless, but a couple do wear knit caps. The oarsman appears to be in shirtsleeves, but the remaining tars are lucky enough to have jackets. The two men at the bow both wear petticoat trousers/slops.